La Academia de los Nocturnos, in collaboration with Ars Hispana and the Fine Arts Circle of Valencia organizes the III Valencia Early Music Course (7-12 July 2014). 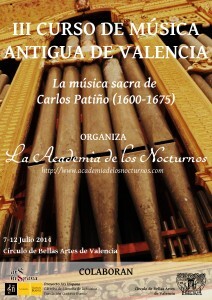 The Valencia Early Music Course consists of a practical and theoretical workshop on historically informed performance. Each year it focuses in the study and performance of a specific repertory of Spanish music. This 3rd edition is dedicated to Carlos Patiño (1600-1675), royal chapelmaster under Philip III.